I have used numpy and installed it with pip quite often in the past. Never experienced any trouble. However currently I seem to be unable to install numpy. First it claimed that I didn't have a visual studio runtime - so I went ahead and downloaded the current visual studio community edition. I downloaded "just" the community 2015 version of visual studio (How do I test/get the correct C compiler from microsoft?) - Is this the problem? I see many (years old) posts about this problem but they typically talked about setuptools or python 2.x. And they often link to older versions of visual studio - I'd like to not install multiple versions of studio unless it's a necessity. And community edition installs the MSC 1900 right? - Can I test that? edit: Also tested now with the 64 bit version of python (why does it default to 32bit?). - "Same" error. As per this answer, The C++ Common Tools feature has to be selected when installing in Visual Studio. 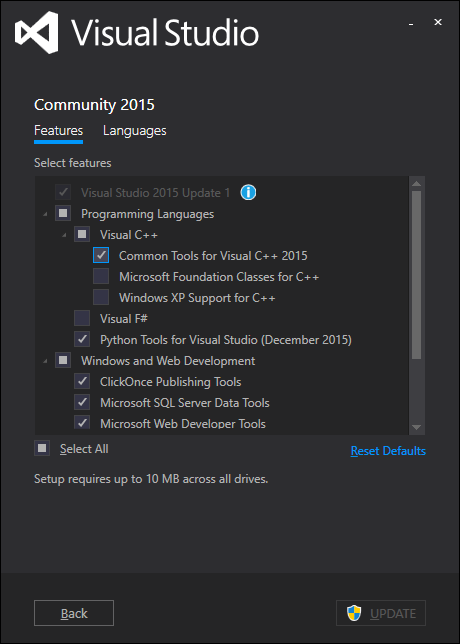 If Visual Studio is already installed, you can add it by reconfiguring it (no need to reinstall everything).